The Games of 2012: We Need Your Guidance People! So if you have been listening to the digital reload the past two weeks you heard the beginning of our progression towards an end of the year show. 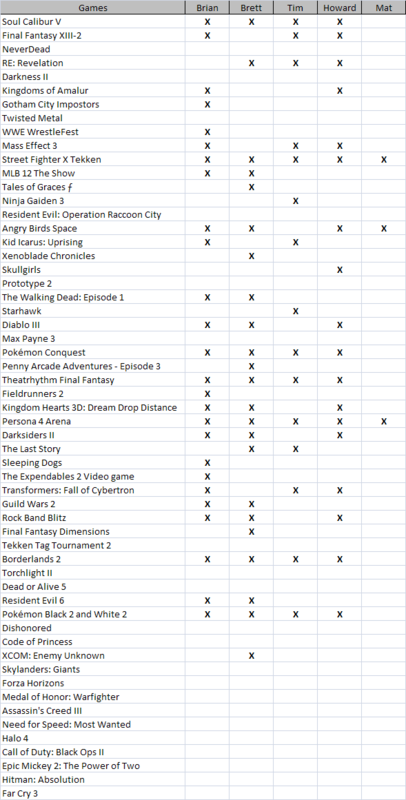 This past Monday we compiled a list of what we have played and (potentially) what we need to play. Have a look! Here is where I ask YOU the readers for some feedback (for real this time) You see above, all the games without an X’s under are names are the ones we need to play before the end of the year. What I want to hear from you is, what should we play first? is there anything missing? TELL US! Post something on our Facebook! We want any and all feedback, a little interaction between us and the readers! GET TO IT!